God burned an appreciation for memorials into the spiritual genetic code of His people, the nation of Israel. We see interspersed throughout the Old Testament instances where the LORD instructed His people to observe memorials for one reason – a call to remember specific events where God wanted to be acknowledged and appreciated. In other instances the Hebrew people out of sheer inner conviction built memorials to demarcate places that wielded special significance in their lives. Some Background On Memorials in the O.T. Why did the Lord choose this vehicle as a call to remembrance? Because it is within our human nature to forget. The ebbing and monotonous flowing of life events through time have a tendency to erase or blur the sharp definitions of thoughts and feelings that at one time were at the forefront of our minds. Particularly, things of a supernatural or extraordinary nature. What Jesus spoke as recorded in Matthew chapter 26 concerning the memorializing of a woman’s sacrifice was earth shattering and shocking. Why? First, this woman’s act of worship and love was not to the casual observer outwardly demonstrative nor particularly miraculous – no parting of the Red Sea or Jordan River, no supernatural intervention by God to annihilate invading armies or the like transpired. What was spectacular about this unnamed woman’s sacrifice was her role in fulfilling O.T. prophecy that Jesus was to be anointed with precious ointment prior to his death. And that was not the end of the matter. Secondly, Jesus told the disciples that a verbal memorial commemorate the action of a woman (of all people!). This thinking was unprecedented in Palestine 2,000 years ago. Women in this region of the world held no social status. Women also had no say in neither the political or religious power circles of their day. Lastly, the selfless giving away of her alabaster box of spikenard meant she forfeited her future possibilities of becoming a bride as the perfume was reserved by a bride for her prospective groom on their wedding day. The woman chose to instead become part of the heavenly bride of Christ – the future culmination of the Gospel. 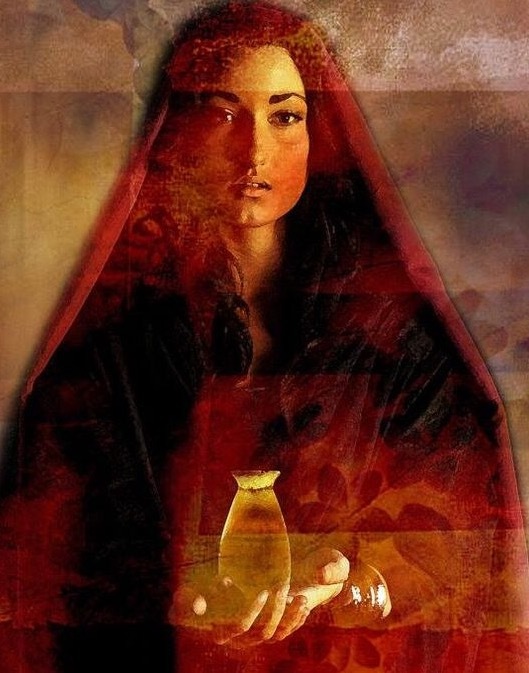 This woman’s act of sacrifice (as perceived by Jesus – the Lamb of God in her midst) established the future pattern of giving and worship for the church – not through the blood of animals, but through the sacrifice of a living human heart infused with love and humility. This is the way of the Gospel. These are the reasons why Jesus honored her sacrifice and asked that her actions never be forgotten. Any Memorials In My Life? I wonder if we not only remember and honor the fallen warriors whose lives have brought us freedom, that we build our own memorials to remember those that have gone before us whose prayers, unselfish love, unending sacrifice and unquestionable faithfulness and integrity of character has granted us the spiritual liberty and protection we also embrace today.